Once you have identified your data elements that will drive circulation policies and have created your circulation rules, you are ready to begin creating your circulation policies. If you are managing a small number of rules, you can create and manage circulation policies in the staff client via Admin > Local Administration > Circulation Policies. However, if you are managing a large number of policies, it is easier to create and locate rules directly in the database by updating config.circ_matrix_matchpoint. The config.circ_matrix_matchpoint table is central to the configuration of circulation parameters. It collects the main set of data used to determine what rules apply to any given circulation. It is useful for us to think of their columns in terms of match columns, those that are used to match the particulars of a given circulation transaction, and result columns, those that return the various parameters that are applied to the matching transaction. Circulation policies by checkout library or owning library? If your policies should follow the rules of the library that checks out the item, select the checkout library as the Org Unit(org_unit). If your policies should follow the rules of the library that owns the item, select the consortium as the Org Unit (org_unit) and select the owning library as the Copy Circ Lib (copy_circ_lib). Renewal policies can be created by setting Renewals? (is_renewal) to True. You can apply the duration rules, recurring fine rules, maximum fine rules, and circulation sets created in the above sets when creating the circulation policy. Start by replacing the default consortium-level circ policy with one that contains a majority of your libraries' duration, recurring fine, and max fine rules. This first rule will serve as a default for all materials and permission groups. If many libraries in your consortium have rules that differ from the default for particular materials or people, set a consortium-wide policy for that circ modifier or that permission group. After setting these consortium defaults, if a library has a circulation rule that differs from the default, you can then create a rule for that library. You only need to change the parameters that are different from the default parameters. The rule will inherit the values for the other parameters from that default consortium rule. Try to avoid unnecessary repetition. Try to get as much agreement as possible among the libraries in your consortium. In this example, the consortium has decided on a 21_day_2_renew loan rule for general materials, i.e. books, etc. Most members do not charge overdue fines. System 1 charges 25 cents per day to a maximum of $3.00, but otherwise uses the default circulation duration. 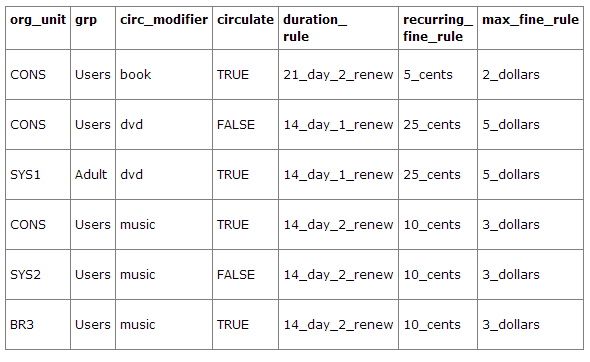 This example includes a basic set of fields and creates a situation where items with a circ modifier of "book" or "music" can be checked out, but "dvd" items will not circulate. The associated rules would apply during checkouts. This example builds on the earlier example and adds some more complicated options. It is still true that "book" and "music" items can be checked out, while "dvd" is not circulated. However, now we have added new rules that state that "Adult" patrons of "SYS1" can circulate "dvd" items. The following circulation settings, available via Admin > Local Administration > Library Settings Editor, can also affect your circulation duration, renewals and fine policy. Auto-Extend Grace Periods - When enabled, grace periods will auto-extend. By default this will be only when they are a full day or more and end on a closed date, though other options can alter this. Auto-Extending Grace Periods extend for all closed dates - If enabled and Grace Periods auto-extending is turned on, grace periods will extend past all closed dates they intersect, within hard-coded limits. Auto-Extending Grace Periods include trailing closed dates - If enabled and Grace Periods auto-extending is turned on, grace periods will include closed dates that directly follow the last day of the grace period. Checkout auto renew age - When an item has been checked out for at least this amount of time, an attempt to check out the item to the patron that it is already checked out to will simply renew the circulation. Cap Max Fine at Item Price - This prevents the system from charging more than the item price in overdue fines. Lost Item Billing: New Min/Max Price Settings - Patrons will be billed at least the Min Price and at most the Max price, even if the item’s price is outside that range. To set a fixed price for all lost items, set min and max to the same amount. Charge fines on overdue circulations when closed - Normally, fines are not charged when a library is closed. When set to True, fines will be charged during scheduled closings and normal weekly closed days.